Virtually anyone and everyone that interviews for a position in law enforcement wants to walk away feeling that their interview carried a sense of passion. After all, passion is loosely defined by many as a strength coupled with sufficiently acquired intelligence and skill. Surely anyone that had a passion for this type of hobby would likely be pretty darn good at it, and would have certainly acquired the knowledge and skills necessary to pull it off without falling to his death. So, why not claim that your passion is chasing bad guys and putting them behind bars? I recently perused an article dedicated to general interviews (as opposed to the very unique interview that we call the law enforcement oral board) and with great interest read a sample question posed by the author of the article. I’ve heard this, and variations of this question in more than just a few police oral board interviews and sadly, candidates usually don’t tell us the truth. 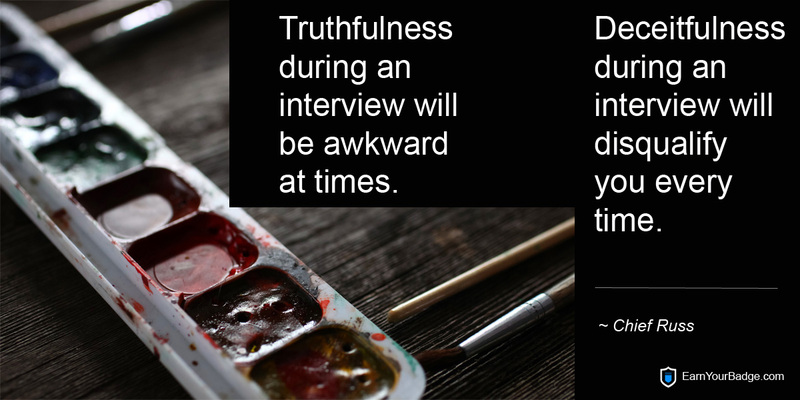 Truthfulness during an interview can be awkward at times, but deceitfulness will disqualify you every time. I’m glad to report, generally speaking, awkward is the feeling of the candidate (you) and not the panel (us) and awkward is a very manageable emotion. When you start feeling awkward in your interview, don’t show it. Plow forward confidently with your comments, statements or answer and we’ll probably never suspect that you don’t like how you’re feeling. Why might I suggest that candidates lie to us when we ask that type of question? Because not everyone is passionate about the same thing, catching bad guys and putting them behind bars and we know that, but that’s what they all say, in some form or another. We want to get to know you and we’re digging into the real you or, at least we’re trying. When a candidate tells us their passion is bringing law breakers to justice, serving their fellow citizens and abiding by the law, we know better. Yes, an interview is your chance to sell yourself but if you’d like to do a better job at selling yourself than the next guy, give us the real answer. An answer like this is exactly what we’re hoping for. I’ve been painting landscapes since I first picked up a paint brush at age three. Of course I’ve moved on from printer paper and water color paint trays to acrylic and canvas (interject a smile) but I’ve found that every time I pick up a brush I feel a sense of relaxation that only painting offers. I’m so passionate about this hobby that three years ago I began sponsoring a painting class at the senior center just two miles from my home. I donate the materials three times every year and the feeling I get from seeing the joy on the faces of my elderly students is indescribable. I just love it. If you answer like most applicants, the panel hears “Blah blah blah, and blah blah blah, and blah blah blah” and they’re thinking, here’s another guy that thinks we actually believe this stuff. Painting landscapes probably is’t your thing, but you get the idea. Think about this. What did the panel just hear when you told them about your real passion, as opposed to BS-ing them? They heard that you engage in a normal, safe hobby, painting, and your passion comes out so strongly that you donate some of your time and money to a worthy cause and, you like elderly people. You’re a winner in their eyes, guaranteed. Your honest answer will cause them to believe that you have been, and will continue to be honest during the remainder of your interview. Now they like you, and agencies hire likeable, honest people over bland, deceitful people every time!